The Grandville series is set in a steampunk-style, alternate-Victorian era where robots stalk the streets and messages are delivered by 'pneumail'. Britain is slowly emerging from a long subjugation by France following defeat in the Napoleonic Wars, while Paris, known as Grandville, is the glittering centre of the world. Most of the characters in the series are anthropomorphic animals, birds and fish, with the rare human 'doughfaces' treated as an underclass. The hero of the stories is Inspector LeBrock of Scotland Yard, a badger whose brilliant deductive abilities are matched by his strength and ferocity in a fight. The three books so far released have been in a full colour, hardback format, with covers inspired by the art nouveau movement. Bête Noire weighs in at 95 pages. A digital version is also available from Dark Horse Digital for e-readers and tablets. 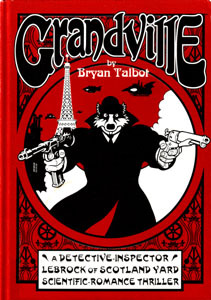 Featuring a world populated by anthropomorphic animals, Grandville has an allohistorical setting in which France won the Napoleonic Wars and invaded Britain. 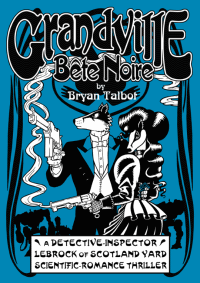 Initially announced in November 2010, the third novel, Grandville: Bête Noire, will continue the exploits of badger Detective-Inspector LeBrock of Scotland Yard. A third book in the Grandville series of graphic novels by Bryan Talbot has been confirmed. 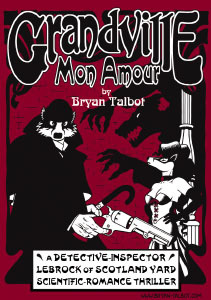 Talbot revealed on his Twitter account that the new book, set in a steampunk world with an alternate history and with a population mostly of anthropomorphic animals, will be called Grandville: Bete Noire. There are plans for a total of five books in the series.